Let me introduce you to my new favorite dinner. I’m certain it’s my favorite because I couldn’t stop slurping the peanut butter coated sweet potato noodles out of my bowl. I licked that bowl clean like you wouldn’t believe. You know there’s no stopping me when it comes to that PB. And ummm yes this dinner is everything I’ve been dreaming about in my life. SWEET POTATO NOODLES IN A SPICY THAI PEANUT SAUCE. Tell me, how delicious does that sound? While I could describe it to you (in incredible adjectives), but the only real way to experience this phenomenal flavor is to try it yourself. And did I mention that you can have this gorgeous, healthy dinner on your table in less than 30 minutes? YASSSSSS. First of all I used organic chicken breast, which in my opinion, is what you should be using these days. Just Bare Chicken is one of my favorite brands because they’re also hand-trimmed, which means I have less prep work to do. Next up, you’re probably wondering about the sweet potato noodles. To create the ‘noodles’, all I used was this spiralizer I purchased off Amazon. 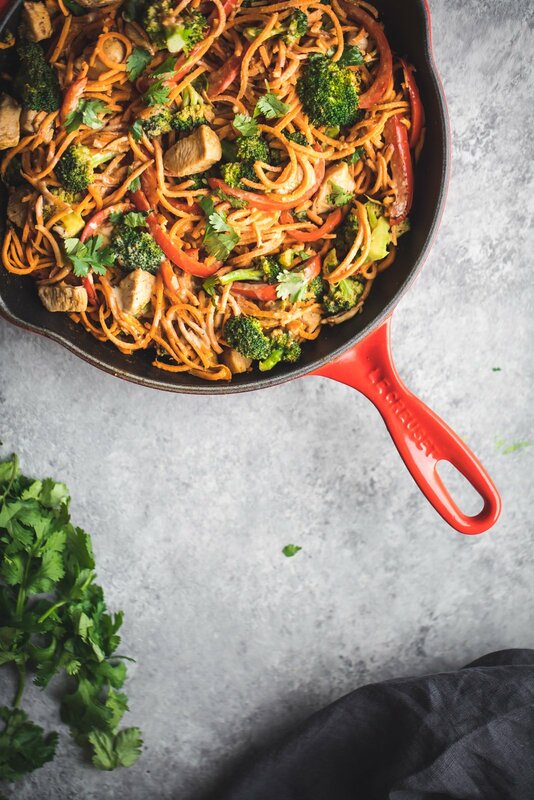 If you don’t own a spiralizer yet, you should definitely think about purchasing one; it’s a great way to enjoy more veggies and create beautiful, lower carb meals. And finally, the peanut sauce. It’s a little spin off of my Thai peanut sauce that was originally used in this all time AK favorite quinoa salad. I added a little sriracha and an almond (or coconut milk) to make it both spicy and saucy. After I took my first bite I ascended to heaven. Yes, it was that good. And I felt even better than it was healthy and packed with good fats, fiber and plenty of protein (36g!). Please don’t doubt me when I say that YOU NEED TO MAKE THIS! Slurp those noodles up, my little peanut butter lovers. xo! If you make this, be sure to let me know by tagging #ambitiouskitchen on Instagram. I love seeing your creations! 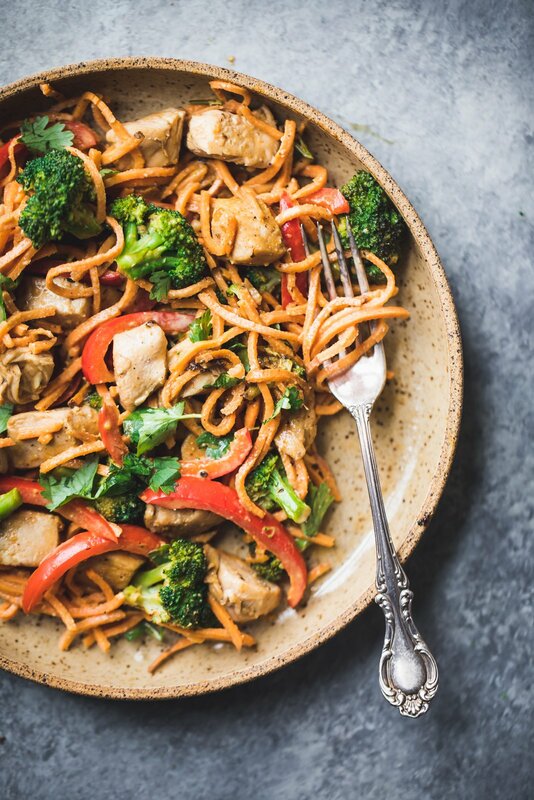 A slightly spicy and addicting Thai peanut sweet potato noodle stir fry with chicken and veggies all on top of gorgeous spiralized sweet potato noodles. Healthy, protein-packed and ready in less than 30 minutes. Make the sauce: In a medium bowl whisk together the peanut butter, soy sauce, ginger, garlic, sriracha, honey, sesame oil and almond/coconut milk until smooth. Set aside. Cut the ends off of the sweet potato and then use your spiralizer to spiralize it; if you don't have a spiralizer you can use a julienne peeler to make the noodles. Set noodles aside. Next season the chicken pieces with salt and pepper. Heat 1/2 tablespoon of sesame oil in a large skillet or saucepan over medium high heat. Once oil is hot, add chicken pieces and cook for 4-6 minutes or until no longer pink. Once cooked through, remove chicken and transfer to a bowl. 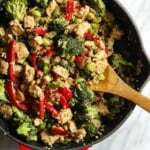 Add in the other 1/2 tablespoon of sesame oil to the skillet along with broccoli florets and red pepper strips. Stir-fry for about 5 minutes until the broccoli is a little tender, then add in sweet potato noodles and cook for 1-2 minutes longer. Next add in peanut sauce and chicken; stirring to coat veggies. Reduce heat to medium low and cook for another few minutes until sweet potato noodles are al dente. Garnish with green onions, chopped peanuts, and cilantro, if desired. Serves 4. Instead of peanut butter, you may use another nut butter such as almond or cashew butter. I would recommend cashew butter. 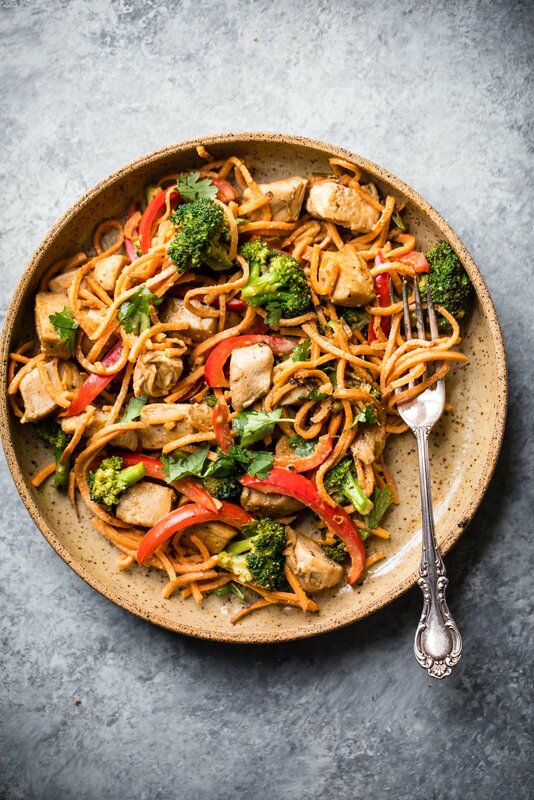 111 Responses to "Spicy Thai Peanut Chicken Sweet Potato Noodle Stir Fry"
Love the all the flavors going on in here. Since I am Vegan, I will sub tofu for chicken. Can’t wait to try it! I love the idea of sweet potato noodles and will have to give this a try. Looks so flavorful! I never thought of making sweet potato noodles! What a delicious Thai-infused recipe!! I have to try this! I love this! I have made sweet potato noodles only a couple of times before but never thought to do a thai peanut sauce with them. Genius! OK, I’ve been meaning to get out there and try using a spiralizer. This recipe just sent me over the edge! It’s officially on my birthday list (it’s soon–so my husband now knows it’s at the top of the list!). Can’t wait to give this a try! Sweet potato noodles and peanut sauce are my EVERYTHING. I can feel a dinner obsession coming on, and I think I’ll be eating this for the next few WEEKS. Pinned! It’s so hard to find chicken that actually tastes the way it should so I’ll be looking out for these!! This looks amazing! I love sweet potato noodles and I bet their sweetness is so good with this spicy sauce. 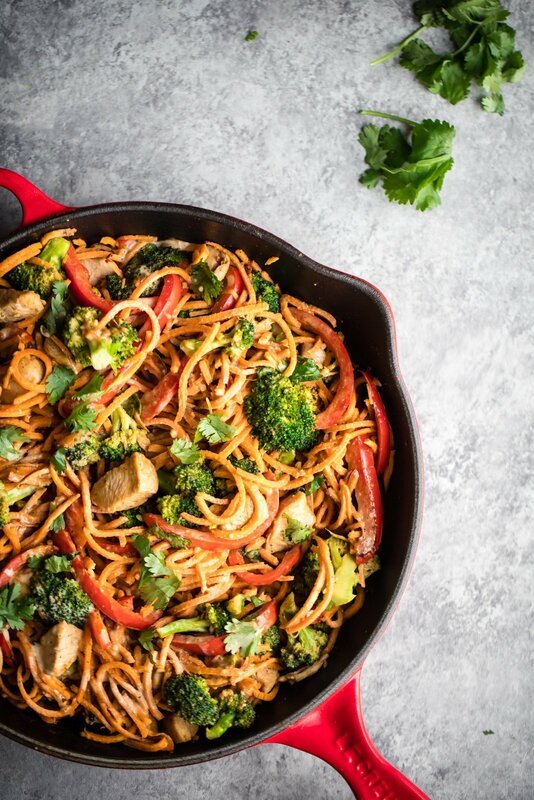 you had me at “peanut butter coated sweet potato noodles ” Looks fantastic! We are the same age and you are literally my foodie and fitness twin – why am i not an awesome blogger like you?!?! and why are we friends in real life?! just saying. I am also making this tonight after spin. I made this tonight and it was absolutely amazing even my picky husband approved! I was making inappropriate noises at the dinner table. 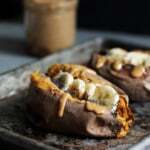 I am not a huge sweet potato fan, but with this recipe I am!!! Wow! I made this last night and it was lovely I’ll definitely be making it again. I used slightly more broccoli and pepper than the recipe stated, and next time would probably add another veg as well and reduce the sweet potato by 1/4-1/3. I don’t have a spiraliser so used a julienne peeler, it worked well and was pretty easy though. I made two portions and had the second portion for lunch, it reheated well in the microwave. Made this last night and it was awesome! I actually used PB2 and it still turned out delicious… and will have leftovers for days 🙂 thanks for another great and easy recipe! Looks amazing! However, I’m not a huge broccoli fan, any suggestions on what to sub for it that might also be good in this recipe? Can’t wait to try it! ohhhhh my goodness. Just made this for dinner and it was AMAZING! So tasty. My boyfriend loved it as well and said it is one of his favorite meals I’ve ever made (and I cook a lot!). Needless to say– definitely going in the regular rotation. So excited to have leftovers for lunch tomorrow. Thank you!!! 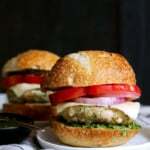 Just wrote down the grocery list to make this for dinner tonight! Girls night in with a bottle of wine and some ANTM! Yes please! I just made this- although the sauce and everything is awesome, my sweet potatoes are still crunchy and tasteless! I know you are usually supposed to roast the sweet potatoes, but I just followed the directions on here. I have leftovers for this all week, anything I can do, or did I do something wrong?? I have the spiralizer, and did the noodles that way. It sounds like you might not have sautéed them long enough in the pan. Add a little water next time and try them before adding the sauce to ensure they are cooked to your liking! I made this for dinner last night, and both my boyfriend and I loved it! It was super filling and felt so much healthier than Thai takeout with actual noodles, and I’m excited to dig into the leftovers for lunch today. Thanks for sharing! I’ve made this twice and it definitely takes longer than 30 min, but totally worth making!! Thanks for your note. I made it last week and I think it depends how you spiralize your sweet potatoes because they didn’t take long for me to cook at all. Mine were very thin! Thanks for the heads up though!! That’s a good tip about softening the sweet potatoes! Mind were a bit thicker so they took longer (maybe I used the wrong blade attachment). I also doubled the sauce because I like things saucy – OMG I’d eat that sauce out of a leather boot! I confess that I did use canned coconut milk and it was AMAZING!!!!! Wow! This was good. I used my homemade Sunbutter instead. This is AWESOME. My Whole Foods sells sweet potato noodles in the produce aisle, which meant a super fast, delicious and nutritious meal. This one is a keeper! Any idea how many pounds of sweet potatoes I need? I bought a bag and they seem on the small size. I can’t wait to make this for dinner this week! This recipe looks so yummy, and I cannot wait to try it. I do want to let you know however, that when attempting to access this recipe on my I-phone, both online and in the Pintrest app, it is completely spammed with the UberEats app. No matter what page of your website I visited, it would never load completely. It would get about 90% and then take me to the app store to buy Uber Eats. I had to whip out the old laptop to get this recipe. Made this last night, and my husband had thirds! The sauce was amazing. So glad you enjoyed it, Kelly! I didn’t have any sweet potatoes on hand, so I got creative with chickpea pasta! I used the starchy pasta water in the sauce in place of the almond milk and it made a delicious and creamy peanut sauce! I tossed a dash of cornstarch in to thicken everything up. Thanks for the flavorful inspiration!! Sounds amazing though, I personally love chickpea pasta! Making this tonight! So excited to try another one of your tasty healthy meals! Made this tonight and added a little more PB and apple cider vinegar to the sauce. It was SO GOOD! Thanks for the fantastic recipe! I made this recipe tonight as posted and only adjusted the shriracha by half to appeal to my non spicy food family. Everyone ate it, the consistency was excellent, but it received a non-repeat vote. It was nothing special and missing something said they. I’m glad you guys tried it out! I liked this! Would make it a little spicier next time. Quick to pull together. Family friendly…..empty plate club! I’m so glad! It’s a great weeknight go-to. Feel free to spice it up a little next time, too! I just wanted to say I L-O-V-E this recipe. It’s super creative and very delicious. I’ve tried it several times. Sometimes I make the recipe to the T and other times I mix and match what I have around the kitchen, but no matter what, it always turns out amazing! Hi Marina! I’m SO glad this one is a winner for the family 🙂 It’s one of my go-to’s for an easy, delicious weeknight dinner. Enjoy! We made this and it is something the whole family liked- including the little kids. Little ones helped me make the noodles and had a blast! I used orange peppers to hide in the potatoes. Definitely making a regular in our meal rotation. Amazing! So glad the kiddos enjoyed this one, too 🙂 One of my go-to weeknight meals! I made this last night and I swear the sauce almost didn’t make it to the pan, I wanted to drink it straight out of the bowl! I didn’t have sriracha (I know I know, but we’re Cholula disciples) so I used that and some Gochujang Chili paste and It. Was. Amazing. Green beans were a great sub for brocolli. Used the medium thickness spiralizer setting on my kitchenaid I might have cooked the sweet potatoes just a little bit more (Boyfriend was a little meh about them being crunchy, I loved it). For veggie eaters you can also omit the chicken and scramble an egg in there as well. Fantastic recipe! Thanks! Isn’t the sauce amazing?! Your subs sound perfect in here. Chickpeas are also great for veggie eaters, but the egg sounds fantastic! Just made this dish for dinner. Super delicious! Sweet potato noodles were a success, I used a julienne blade. Didn’t have broccoli but I had asparagus and two red peppers,added garlic. Increased the milk,didn’t have peanuts,added some crunchy peanut butter. Good peanut taste! Thanks!! Making this tomorrow! Would maple syrup work as a sub for the honey in this? Hi Cindy! Maple syrup should work fine in here. Hope you enjoyed this one! Making this recipe was my first time using sweet potato noodles and good grief were they delicious. I bought the “noodles” pre-made from the store since I don’t own a spiralizer. My family and I loved the recipe! And the ease of assembly was great for a busy weeknight. Amazing!! And totally agree on the sauce – I always make sure the sauce ratio is on point 😉 Happy you guys loved this one! Do you what sodium is for dish? May be an issue with my making this. I didn’t calculate sodium for this one – sorry! You could check the sodium content for each of the ingredients if you’d like. This recipe looks De-lish! We don’t consume soy in any manner, any substitutes you can suggest? Thanks for all your great recipes, I’ve made quite a few of them! Made this tonight! AMAZING SAUCE! Added extra meat for my son that likes a lot. Will need to add more veggies for the leftovers. But he loved it so much, there might not be any! This is SO delicious!!!! My new favorite recipe! Thank you for making and sharing healthy, yummy meals! So happy to hear that Molly!! Love this! I used coconut milk in sauce. I added sweet yellow onion and fresh ginger to the stir fry to bump flavor. Topped with cilantro, peanuts and a squeeze of lime. This was not hot enough for me so I added red chili paste to the top. Perfect!! I tried this and it’s delicious! Never tried a vegetable noodle before, and sweet potatoes aren’t my favorite, and so I was surprised to find that the sweet potato noodles didn’t taste like sweet potatoes! YUM. I used a julienne peeler instead of a spiralizer, only because the peeler is all I had. I also used the powdered peanut butter (from the broccoli red pepper quinoa chicken dish a la Ambitious Kitchen) instead of peanut butter from the jar. This recipe has been added to my recipe book! Thanks for all of your delicious recipes! Aren’t the sweet potato noodles great? So good. Glad you loved this one! How do I get a hold of Monique regarding nutrition facts??? Wow, this is OUT-standing! I cheated and just added chopped sweet potatoes. Next time, I might add purple cabbage too! So excited for lunch this week! Perfect! Love this one for meal prep. Made this for dinner last night. Husband and I devoured it! Love how you can sling in any veggies that you have and husband added extra hot sauce to his afterwards. That peanut sauce is scrumptious! So happy to hear that! And yes this one’s perfect for adding in any veggies you have. Delicious! Love this recipe and so healthy! So glad you love this one! can you use toasted sesame oil?